Mobile suits don’t stay pristine for long. In any Gundam series, you’ll see suits soar into combat while enduring blasts, bullet damage, and exposure to the elements. It’s no surprise that these hardships leave their marks. 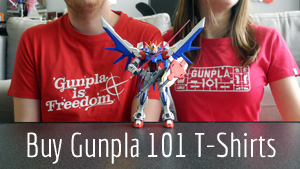 If you want to build a Gunpla model that looks just as battle-hardened as its TV doppelganger, you’ll need to add these marks yourself. This process is called weathering, the practice of distressing the model so it appears as if it’s been through heavy use. 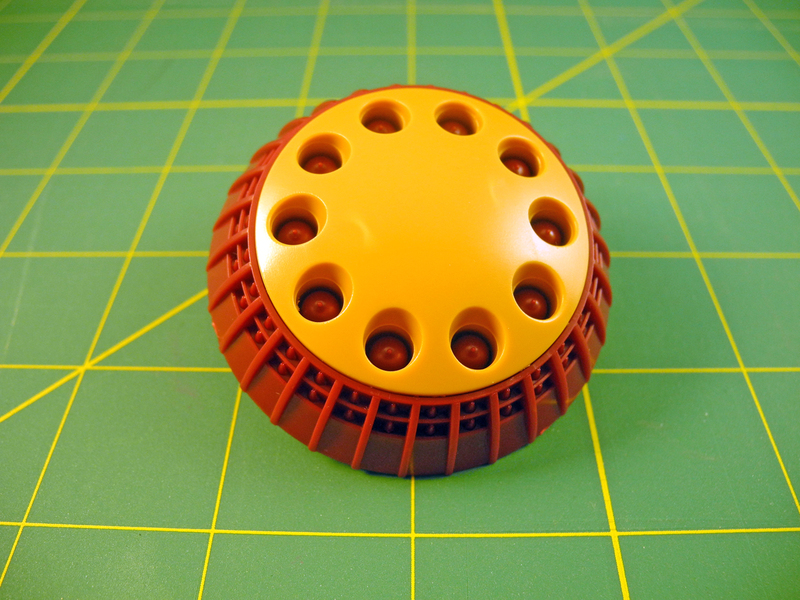 For my first weathering project, I decided to start small and focus on one of the Gundam series’ most iconic accessories—the Gyan shield. I wanted the shield’s ten missile launchers to look used, like the blasts had left gunsmoke stains. I wanted the red exterior to look a little rusted and worn. This is the shield out of the box, assembled but un-weathered. In order to go from Point A (gestures above) to Point B (gestures at the top image), I used two different sets of weathering tools. 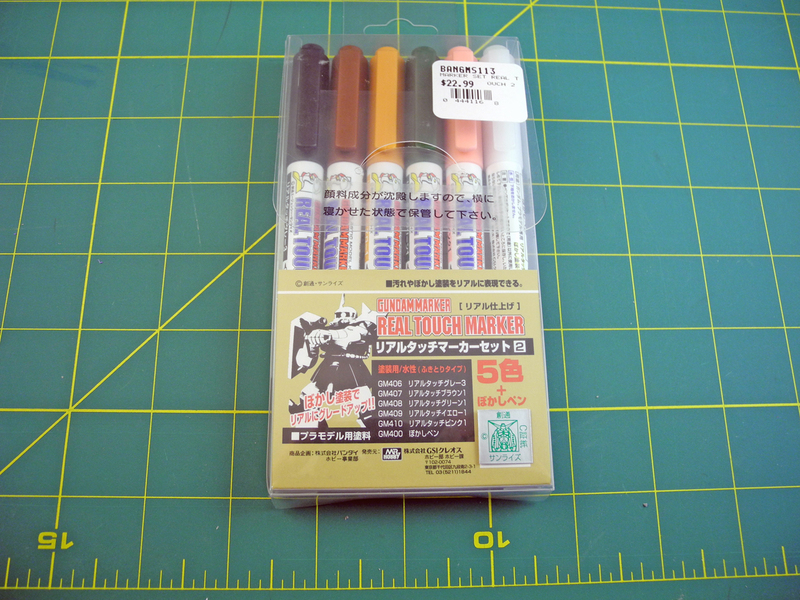 These are official Gundam Real Touch Markers. As you can see, I got them for about $23 at a local hobby store (though my link shows you where to get them for $10). These markers are double-sided, with a thick tip on one end and a thin tip on the other, so you can use them for either broad strokes or detail work. The sixth marker is clear, for blending. And here we have some Tamiya weathering kits and an applicator. 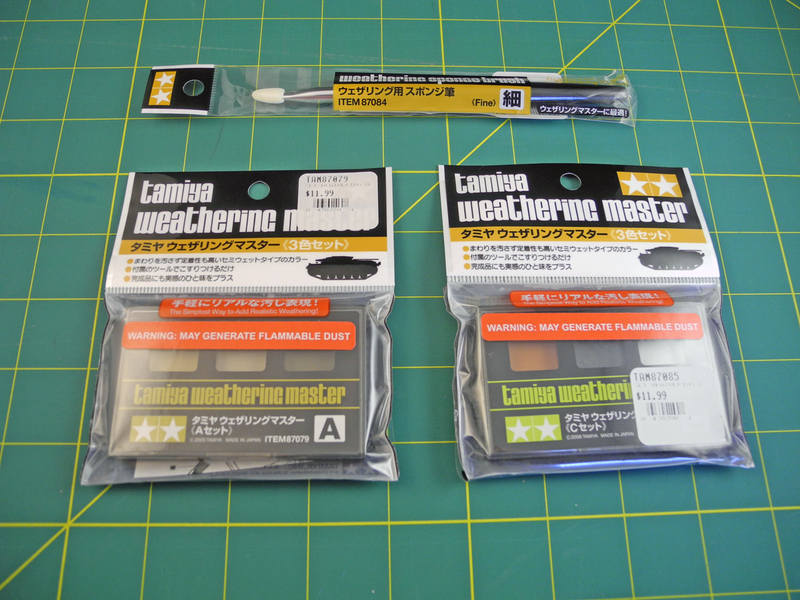 I bought Tamiya Weathering Master Kit A, which includes “sand, light sand, and mud” and Master Kit C, which includes “orange rust, gunmetal, and silver.” The sponge brush applicator is nice, but turned out to be unnecessary because each weathering kit comes with its own double-sided sponge-and-brush applicator. There are six weathering kits total, A-F, and you can get a deal buying them all at once if you’re really gung-ho about weathering. I’d recommend Master Kit C for beginners because it is not dependent on a setting. Kit A works for suits that fight in the desert, like say, Ramba Ral’s Gouf. Not every model would look accurate with sand damage. However, every mobile suit can get rusty, and any suit with a rifle can get damaged by gunsmoke. Don’t these palettes look just like cosmetics kits? According to the hobby shop manager, that’s because Tamiya knew people were already using eyeshadow as a model weathering tool. 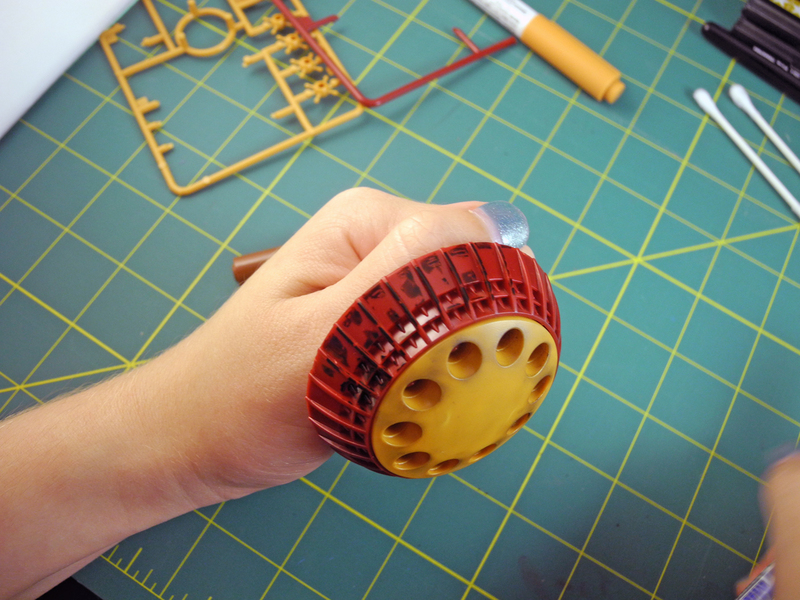 Just don’t get them confused, because unlike eyeshadow, these paints may “generate flammable dust.” Here at Gunpla 101, we strongly recommend wearing painter’s gloves while working with Tamiya weathering kits. The first thing I did before even touching the shield was test my materials. I used leftover runners from the Gyan kit to see how my weathering tools looked. 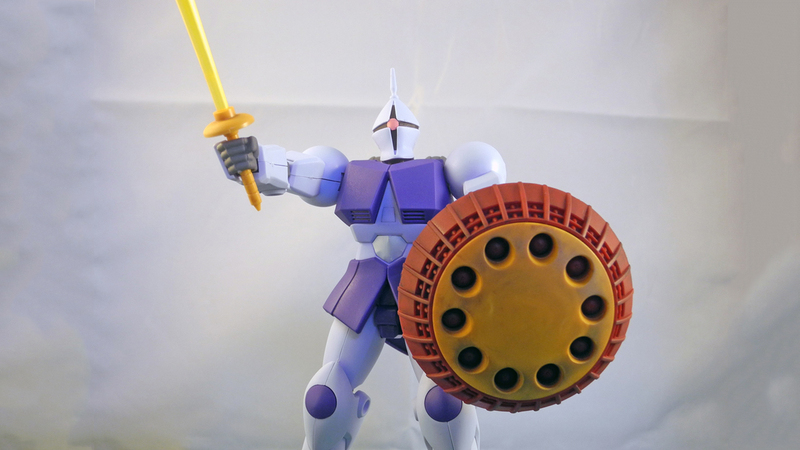 I began by applying the brown Gundam Real Touch Marker to the runner the outside of the shield came from. I wish I had gotten a photo of the marker in action, but just imagine a felt tip like a Magic Marker. I blended with my fingers because I kind of forgot about the clear blending marker that comes with the collection, oops! Once I was happy with the effect, I applied it. It looks super messy, but I knew from testing on the runners that when I blended it, it would give me just the amount of distress I needed. As you can see in the next image, it’s pretty subtle once it is blended. There’s not really any technique involved in using the marker. It was a lot like panel lining, where you color sloppily at first and then wipe it away, praying that a hint of color sticks to the edges of the plastic. 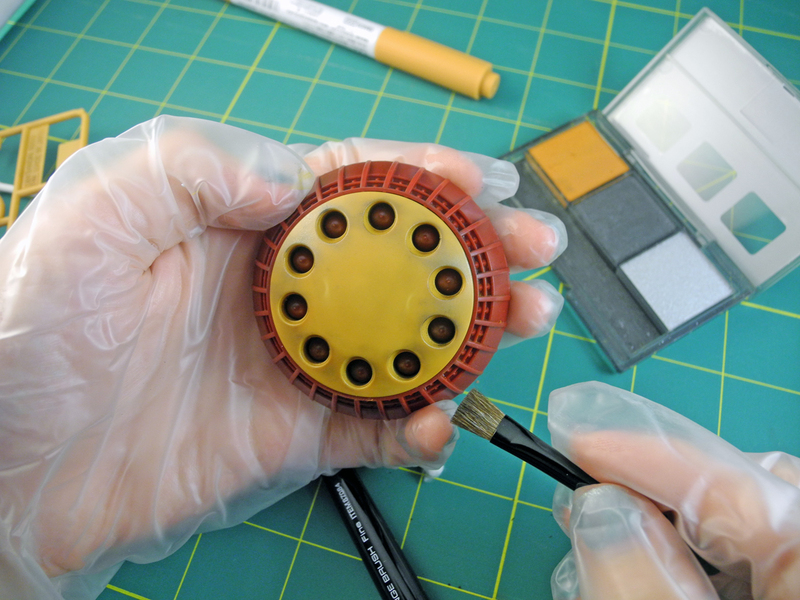 Next, it was time to get my gloves on so I could use my Tamiya weathering kit. I am wearing cheap, disposable latex gloves. After testing the way the “gunsmoke” color looked on a spare runner, I began to apply it directly to the shield. Since the Gyan shield is able to shoot missiles, I thought it would be accurate to have gunsmoke stains around the point of exit. 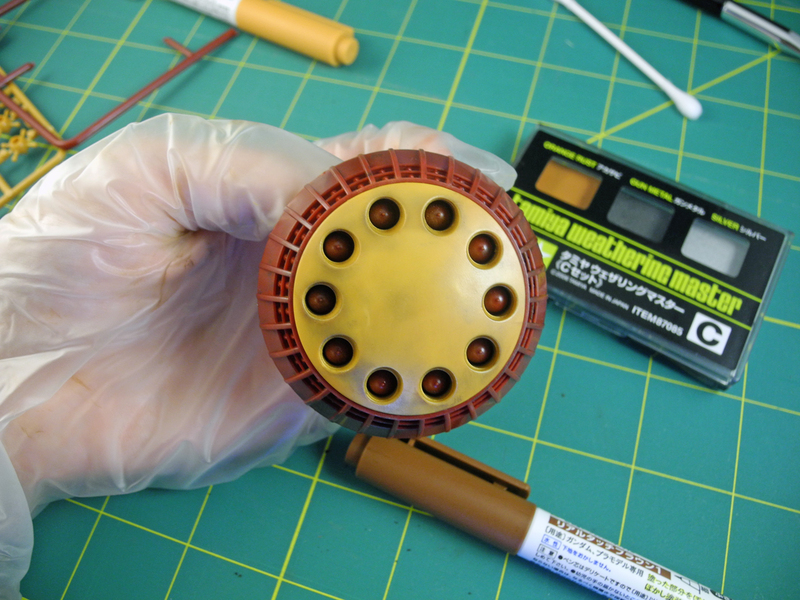 In this photo, I’m using the applicator that came inside the weathering kit. If I had to describe my technique, I’d say I just lightly feathered the brush around the shield, rubbing it in a circular motion around each of the missile launchers. I figured that swiping it up or down would look gravity defying, while a circular motion gave me an effect that seemed to radiate outward. This is what the shield looked like after I was done applying the marker and weathering paint. Not bad for my first try! This kit is all ready to be top-coated. However, let’s say you’re nervous about just going ahead and weathering a model the way I did. You want some sort of real life undo button. I have a solution for you! 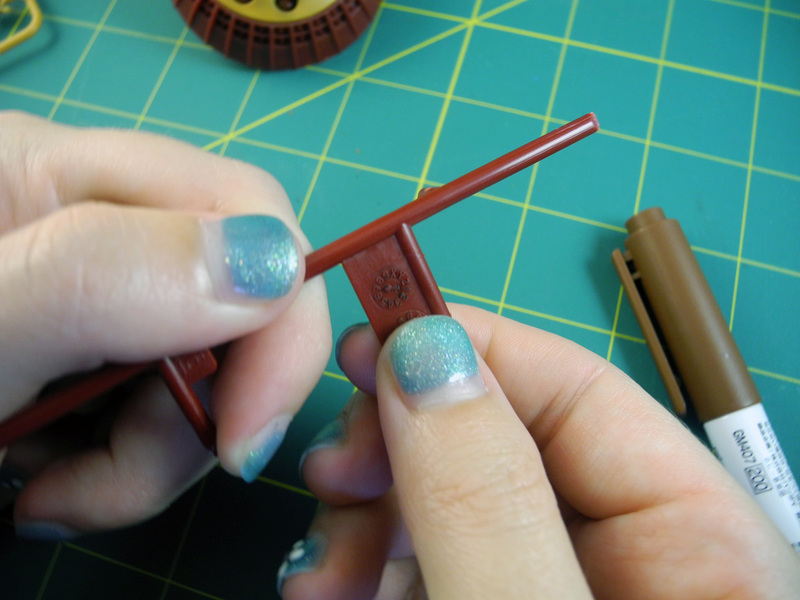 Apply the top coat BEFORE you begin weathering. That way, the weathering paint will not adhere directly to the plastic. You can rub it off of the top coat and try again. 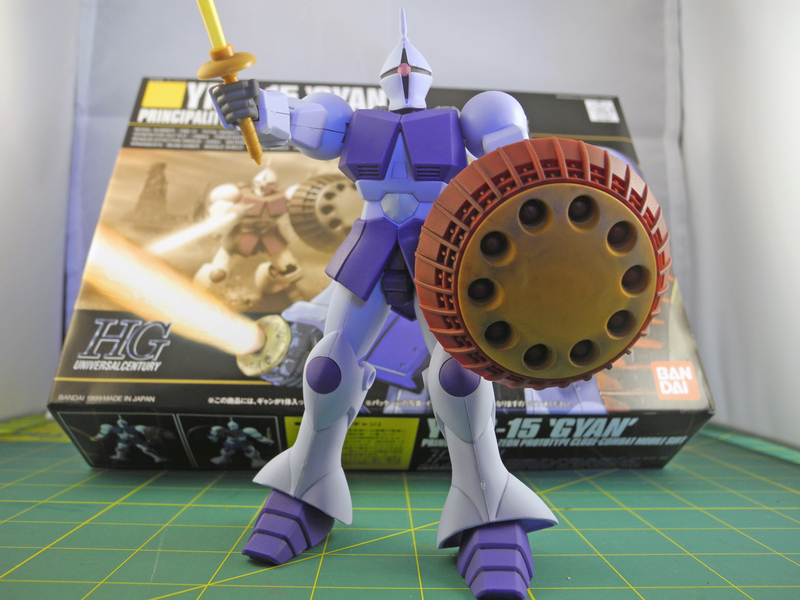 Here’s the Gyan wearing top coat and a weathered shield. I did not weather any other part of the model, which maybe looks a little odd. I hope you enjoyed my weathering tutorial! As usual, post your questions in the comments section!